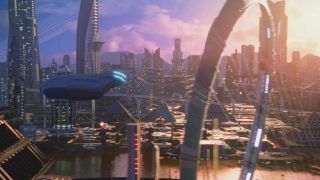 The crew visits Alara's home planet, Xelayah, in the "Orville" episode "Home." If you're a dedicated disciple of "The Orville," then you've probably seen one of the Facebook groups or discussion forums or YouTube videos that talk about rumors and gossip surrounding the show. Many fans already knew that Lt. Alara Kitan (Halston Sage) was leaving, but the continued mystery surrounding the reasons behind that departure have kept those threads buzzing. However, the general consensus is that it was a simple scheduling conflict on the actor's part. Isaac (Mark Jackson) arm-wrestles Lt. Alara Kitan (Halston Sage) in what has become a regular Friday fixture in the Orville's mess hall. During what seems to be a weekly wacky arm-wrestling event in the ship's mess between the equally matched Isaac (Mark Jackson) and Lt. Kitan, the artificial life from Kaylon 1 accidently breaks her arm. Naturally, the young Xelayan officer receives treatment from Dr. Finn (Penny Johnson Jerald), who notices that Alara's muscle mass and bone density have decreased during her time on the USS Orville under the equivalent of Earth's gravity, 1g. It appears that Alara must return to her own planet, where the gravitational pull is many times greater than the planetary average, which means Xelayans have superhuman strength in Earth-like environments. Once there, she can begin the healing process and perhaps, in time, return to the USS Orville. To this point, this potentially predictable departure episode is handled well. Some great camera angles enliven the arm-wrestling opening, plus any opportunity to watch Robert Picardo — who plays Alara's father, Ildis Kitan — on television is a delight. Alara (Halston Sage) has an interim replacement, Lt. Tharl (Patrick Warburton), who is an alien with a "crazy high metabolism" and two esophagi. Both her father and her mother, Drenala Kitan (Molly Hagan), opposed Alara's enrollment in the Planetary Union and instead wanted her to pursue a university degree, like her older sister, Solana (Candice King), did. Apparently, however, Alara is of below-average intelligence for a Xelayan, which heavily influenced her decision, and as a result of her superhuman strength, she was fast-tracked to becoming chief of security on the Orville. Meanwhile, Alara's interim replacement, Lt. Tharl, arrives, played by Patrick Warburton, who just about owns every single scene he's in, regardless of the series. Here, he's tragically underused, playing an alien with a "crazy high metabolism" and two esophagi in a fairly forgettable attempt at uncomfortable-new-guy humor. Alara's family welcomes her home, but the inevitable clashes arise as her parents make their feelings known about her potential return to the Orville and the Planetary Union. In an attempt to smooth things over and get the Kitan family to bond a bit, Ildis suggests they all take a trip to their beach house in the Xelayan equivalent of the Hamptons. Here, we meet their neighbors from the next house up the beach, Floratta (Kerry O'Malley) and Cambis Borrin (played by another "Star Trek" alumni, John Billingsley). And suddenly, this episode jumps on an express train to Insaneville. Cambis turns out to be utterly bonkers, which will catch anyone nodding off at this point by complete surprise. His turn makes this episode much more interesting. The husband and wife team of Xelayan psychos hold Alara and her family hostage. Turns out that many years ago Ildis disputed some medical breakthrough or other made by Cambis' son in a scientific journal and ruined the researcher's career. After that, the son took his own life, so it's all about revenge. Since Alara has a bit more experience than her more academic-focused family dealing with life-or-death situations, she takes the initiative and eventually overpowers the deranged duo. At the same time, her injured father saves the life of the injured Cpt. Mercer (Seth MacFarlane), who had just landed unannounced in a shuttle in an attempt to persuade Alara to come back. Phew. Viewers get a glimpse of the Orville crew's environment suits for the first time. Sage turns in another borderline over-passionate performance, but Picardo goes for broke in a truly emotional scene between father and daughter. Tissues will be required at this point. Despite a possible solution that ol' Doc Finn has devised, Alara decides to stay on Xelaya. The bridge crew gathers in the Orville's shuttle bay, as the actors as much as the characters say a sad farewell, with echoes of Tasha Yar's funeral. It drags on far, far too long. We know that "The Orville" is a love letter to "The Next Generation," and there will inevitably be similarities, but the untimely exit of the security chief in both series is just plain bizarre. It's still too early to call thumbs up or thumbs down on "The Orville," because only 15 episodes have aired, while "Star Trek: The Next Generation" averaged an impressive 25 episodes per season. Perhaps next week, we'll meet Alara's permanent replacement, who is also a young Xelayan female officer, Talla, played by Jessica Szohr. So, a simple straight swap then — at least Tasha Yar was replaced by a Klingon. Robert Picardo plays Alara's father, Ildis Kitan, who comes to an important realization in this episode. Season 2 of "The Orville" airs on Thursday nights at 9 p.m. EST on Fox in the U.S. You can watch it on on demand on Fox Now and Hulu. It's also available on Fox.com in the U.S. In the U.K., the show's on Thursday nights at 9 p.m. GMT on Fox. You can buy the first season of "The Orville" on DVD, and you can purchase a season pass from Amazon.